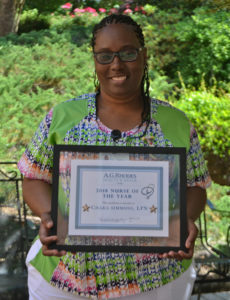 Employee spotlights feature exceptional A.G. Rhodes employees doing exceptional work throughout the organization. Our latest spotlight features Chaka Simmons, a Licensed Practical Nurse (LPN) at our Cobb home. My job basically entails providing customer service to elders and their families, administering medications, admissions and discharging, and providing care and team work. How long have you been working at A.G. Rhodes/working in the long-term care industry? I have been working with A.G. Rhodes of Cobb for six years now, and working in long-term care for 17 years. What made me get into this profession was watching my mom when I was younger in her nursing career. Learning the ability to take care of someone also inspired me, and knowing that it’s not about the money, it’s just being there and helping them that matters. The best part of my job is that I help someone day to day. Also, learning from my elders that no matter what their illness is, I always walk away grateful. First and foremost, if you don’t have a heart to provide care, or if you don’t have patience, this industry is not for you. Long-term care is my joy, and being around my elders also helps me because I see them as a mom and a dad I never had. They may also remind me of someone that was close to me and sometimes I can relate to their illness. What keeps me going is learning more about nursing, and understanding the disease process inspires me to continue my education. Also what keeps me going is knowing that I made a difference, and for my children, I set an example that if you have a passion for something, never give up no matter how long it takes. Passion, love, patience and a smile. You must be willing to learn and accept criticism and don’t dwell on your mistakes—just encourage yourself to do better. And lastly, listen! What do you do when you’re not working (hobbies, family, etc)? Rest and family time with my children. Do you have any advice for someone interested in getting into the long-term care industry? Know your elders and their families, and give them an opportunity to trust you with their loved ones. Family education is important, as well as working as a team. Throughout my career in long-term care, I’ve gotten close to my elders and it can be hard to see the decline process, and to be strong for the family, but always remember the good times you had. Nursing is my heart and working with my elders helps me remember how precious life is. Nursing is caring.